Still thinking of a New Years resolution for 2017? It might be a little late, but here is something for you to consider. Much has been made of the rise of fake news and its influence on the U.S election and indeed, politics in general. Yet what about the social media echo chambers we have created for ourselves? With the help of platforms like Facebook and Twitter, many of us have cocooned ourselves into a neat digital fortress where opposing views cannot penetrate. This needs to change. Were you surprised by the election of Donald Trump and the triumph of Brexit last year? Do you find yourself astonished that there could be so many Australian voters who supported Tony Abbott, and still do? Perhaps you should consider tweaking your social media feeds. Let me explain. One of the interesting findings from the U.S election was the extent to which supporters of Donald Trump, and likewise, Hillary Clinton, had little association or crossover with each other. I’ve read entire articles and Reddit feeds where people were asking if anyone had actually met a Hillary supporter, or even spoken to a Trump voter. Rather than helping to bring groups together, our social media habits risk further alienating us from those with opposing ideas, leaving us ignorantly lacking the empathy required to understand alternative viewpoints. Granted, these are international examples, but I dare say we share similarities here. Research estimates that over 60 percent of Millennials use social media as their chief source of news. Despite companies like Facebook refusing to see itself as an official news source, the reality is that users are increasingly reliant on social media to inform their understanding of the world. Often, that understanding is being fed through a narrow window. This has been and will continue to be problematic as long as users filter what they are seeing. Unwittingly, due to a mixture of our preferences, our friends, and complex algorithms, we are drifting further into a series of isolated digital islands that have little association to the other. Often, we tend to share the views of the majority of our friends. 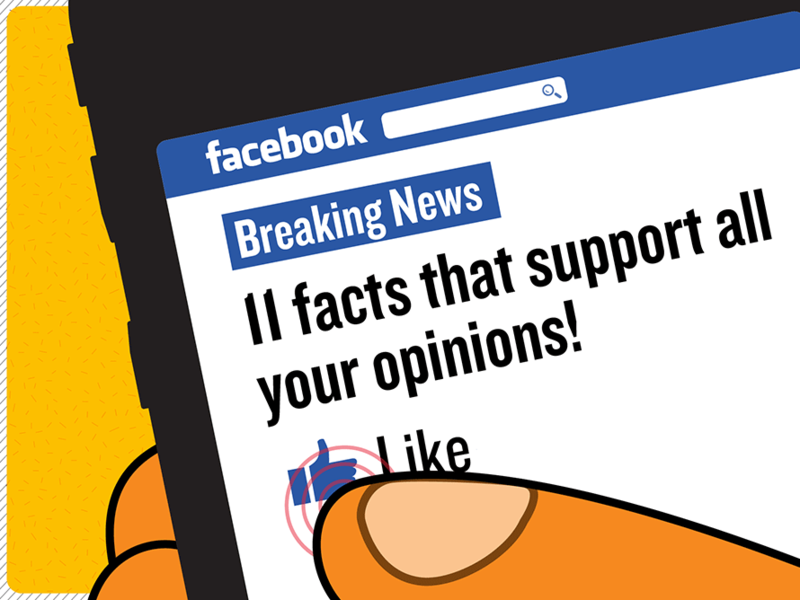 Facebook algorithms then monitor the content that we like and share, and therefore our feeds serve to reinforce rather than challenge our bias. The echo chamber is thus created. I have always voted for the Coalition. Naturally, the content I’ve shared over the years reflects this. A couple of years ago, I remember an old colleague telling me that she had hidden all of my posts because she was sick of them polluting her Facebook feed. Her words. I don’t believe I posted obsessively. There are now browser extensions such as Social Fixer that are entirely dedicated to blocking content that we do not wish to see. Want the words ‘Shorten – Di Natale – Hanson’ deleted from your news feed? Social Fixer has you covered. Users are also empowered to hide posts from particular sources. If users have a problem with Herald Sun articles appearing in their feed, then they must only select ‘hide all’ from that source and the issue is solved. So last year I decided to do something a little different. Rather than like pages and join groups that served to confirm my worldview, I decided to challenge myself to consume content I would normally disregard. I joined groups such as ‘Left Wing and Proud’, ‘Australian Progressive Alliance’, ‘Green politics and discussion group’. I liked Bill Shorten’s Facebook page, followed ‘New Matilda’, the openly left online news source, and even started following Clementine Ford, the prominent and often controversial feminist. I cannot say that I have been able to ‘Like’ the majority of the posts that I now follow, but the experience of regularly reading content that challenges my worldview has left me with an improved and more rounded perspective. So in 2017, my challenge to you is to follow content that you normally would not even think to consume, even if you find it utterly objectionable. Unhide or re-add the friends you have silently exiled. It may not change your worldview, in fact in many instances it may harden it, but at least you will be able to glance over to the other side. Pizza is evidence were not alone in the universe. For years man has look at the stars but now pizza has been found to hold futher life beyond our planet.